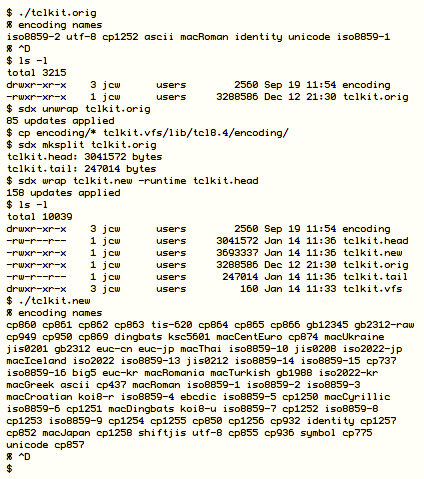 Tclkit has always been distributed with only a few Unicode encoding definition files in it. This was a compromise to reduce the executable size (from 1.4 Mb to 1 Mb) yet be good enough for many common Western languages. That does not do justice to other parts of the world, so here are instructions on how to create a modified Tclkit with all encodings Tcl knows about. The encodings can be obtained from a Tcl source code download (unpack and look in the library/encoding/ directory). I assume that similar steps are also what would be needed on Windows. Copyright � 2008 Equi4 Software. Metakit is a trademark of Equi4 Software.